(UNDERSTANDING THE THREAT) — Since the Armies of Mohammad first made contact with the West, Western leaders understood Islam is a barbaric and evil doctrine that enslaves, consumes and destroys everything in its path. “That it was founded on the Laws of their Prophet, that it was written in their Qur’an, that all nations who should not have acknowledged their authority were sinners, that it was their right and duty to make war upon them wherever they could be found, and to make slaves of all they could take as Prisoners, and that every Musselman (Muslim) who should be slain in Battle was sure to go to Paradise.”–Letter from U.S. Ambassadors Thomas Jefferson (to France) and John Adams (to England) dated 1786 to the Continental Congress detailing the response from the muslim potentate from Tripoli when asked by the Americans why the muslims were attacking U.S. ships and capturing Americans without provocation. “The case is clear in the case of Mohammed. He seduced the people by promises of carnal pleasure to which the concupiscence of flesh goads us. His teaching also contained precepts that were in conformity with his promises, and gave free reign to carnal pleasures. In all this, as is not unexpected, he was obeyed by carnal men. As for proof of the truth of his doctrine, he brought forward only such as could be grasped by the natural ability of anyone with a modest wisdom. “Indeed, the truths that he taught he mingled with many fables and with doctrines of the greatest falsity. He did not bring forth any signs produced in a supernatural way, which alone fittingly gives witness to divine inspiration; for a visible action that can only be divine reveals an invisibly inspired teacher of truth. “On the contrary, Mohammed said that he was sent in the power of his arms–which are signs not lacking even to robbers and tyrants. What is more, no wise men, men trained in things divine and human, believed in him from the beginning. “Those who believe in him were brutal men and desert wanderers, utterly ignorant of divine teaching through whose numbers Mohammed forced others to become his followers by the violence of his arms. Nor do divine pronouncements on the part of preceding prophets offer him any witness. “A degraded sensualism deprives this life of its grace and refinement; the next of its dignity and sanctity. The fact that in Mohammedan law every woman must belong to some man as his absolute property, either as a child, a wife, or a concubine, must delay the final extinction of slavery until the faith of Islam has ceased to be a great power among men…Individual Moslems may show splendid qualities, but the influence of the religion paralyzes the social development of those who follow it. (POLITICO) — Sweden may be known for its popular music, IKEA and a generous welfare state. It is also increasingly associated with a rising number of Islamic State recruits, bombings and hand grenade attacks. Police in the French city of Orléans will be making sure that Muslim worshipers cease using the public street to pray after residents wrote to the city’s government to complain. Deputy Mayor of Public Safety Olivier Geffroy is said to have immediately been in contact with the heads of the mosque to deal with the street prayers which are unlawful due to French public secularity laws, known as Laïcité. “This morning I received the persons in charge of the prayer room. I told them the impossibility of prayers in the public space, with which they completely agreed,” Geffroy said. “They told me that the phenomenon was very punctual and they would strengthen their presence at the entrance, on Rue de Limare, so that the phenomenon ceases,” he said. “The vice-president of the Ibn Badiss association, Mr. Benhammou, told me that he himself would be present with two other people. They also pledged to reiterate the ban with the faithful, under penalty of exclusion of the mosque,” Mr. Geffroy added. The deputy mayor also said that the police would also be on hand to make sure the street prayers stopped. It’s never pleasant to be right about certain situations when an entire group of people suffer because of the lack of their government and some individuals in that nation to engage in critical thinking and listening skills. But, that is exactly what happened in Germany. When the German government of Angela Merkel issued an open invitation to illegal alien invasion of Germany, many individuals predicted the end of Germany as we know it and the beginning of Germany descending into a lawless, crime-ridden society. According to one German refugee worker, she was wrong about open borders, admitted it was “too late” for Germany and has planned to emigrate to Poland. After founding the refugee aid association Working Group Asylum + Human Rights in 2012, Rebecca Sommer was delighted to welcome the deluge of migrants that began arriving in Germany in the second half of 2015. “At that time I wanted to help everyone and truly believed that all these people were fleeing hell and were in a state of complete distress,” Sommer told Polish weekly Do Rzeczy. Along with over 300 volunteers, Sommer began providing German language courses to the new arrivals with the aim of helping them integrate into society. Unfortunately, the truth has won out and the German people are witnessing and experiencing the reality of these warnings. Sommer has realized she was wrong, identifying Muslims as an “existential threat” to Germany. She also observed how the migrants, “regard we infidels with disdain and arrogance,” after they began to refer to her as “the stupid German whore,” a realization that she says has led other refugee volunteers to quit. Sommer now admits that despite her good intentions, she got it completely wrong and that Muslim migration poses an existential threat to the Germany way of life, a problem that will only be exacerbated by the process of family reunification, where migrants will be able to invite their relatives to stay in Germany. “If Poland and Hungary do not give in on this question, you could become countries that some Germans and French will flee to. You could become islands of stability in Europe,” said Sommer, adding that she has been personally attacked five separate times by Arabic-speaking men. Indeed, fear of sexual assault is now so commonplace in Germany that jogging shorts which emit a high pitch alarm when triggered are selling like hot cakes. The question is, “why are not Germans willing to stand up and fight for their country?” Instead of calling up courage to defeat the invasion some of their own people invited, the solution Sommer envisioned is retreat, letting Muslim non-Germans dominate the nation to engage in eradicating German culture, history and landmarks. Sommer, who assisted in the illegal alien invasion of Germany, has chosen to leave instead of trying to fight to reverse the course of cultural destruction she and others initiated. Following the mass sexual molestation of women in Cologne two years ago, Berlin set up “safe zones” where women could congregate to avoid being assaulted. Police statistics for 2016 show that a full half of the crimes committed in Berlin were carried out by migrants. A recent study by the German Federal Ministry for Family Affairs found that there is a direct correlation between the country’s rising violent crime rate and the mass influx of migrants. Sommer concludes that with family reunification, Germany will be swamped by Muslim migrants and that political Islam, which is already beginning to exert its influence in schools, political parties, the government and the police force, will eventually become completely dominant. “It’s too late for Germany,” she adds. In other words, Germans are being brainwashed into thinking they are the ones that need to assimilate to Islamic culture, not the other way around. Look at what has happened with ISIS in the Middle East – archaeological sites, such as Ninevah, have been razed to the ground because Islam tolerates nothing that is not of Islam. Islamists have destroyed other archaeological sites to dig for valuable antiquities in order to finance their destruction of people and country. The same thing will happen in Germany, France, the United Kingdom, and any other sovereign nation where the unfettered illegal alien invasion of Muslims occur. Interestingly enough, someone claiming to be Rebecca Sommers has commented to the original article, on another WordPress blog and on Infowars.com declaring these stories to be “fake news” without providing any clarification on that. The original source article at Delit D’Images can be viewed in English translation here. This story has been picked up by several news agencies worldwide and now, it seems, the activist Sommers may be trying to mitigate the damage caused by her reversal of opinion on illegal Muslim invasion. Those commenting on the article at Infowars.com are not convinced the comment is by the real Sommers. Many refuse to give any sympathy toward her change of heart. IN THIS POWERFUL WORK OF MAGICAL REALISM, an Iranian sickened by the injustices he sees all around him wishes he could experience the true Islam of Muhammad and Ali, Muhammad’s cousin and son in law whom Iranians consider the forefather of Shia Islam. Author F.W. Burleigh gives him his wish by sending him into 7th century Arabia, first as a slave and then as Muhammad’s scribe. He soon finds what he was looking for, but it is not what he was anticipating. After witnessing Islam’s founder commit a series of horrific atrocities, his faith crumbles and he becomes a warner of what is to come out of Arabia. He ends up trapped in Mecca at the time of Muhammad’s invasion and is about to be beheaded when he returns to present day Iran in such a way that shows he is the Shiite Savior—the long-awaited Imam of Time. But what he has to say to his contemporaries brings the rage of Iran’s clerical rulers down on him. 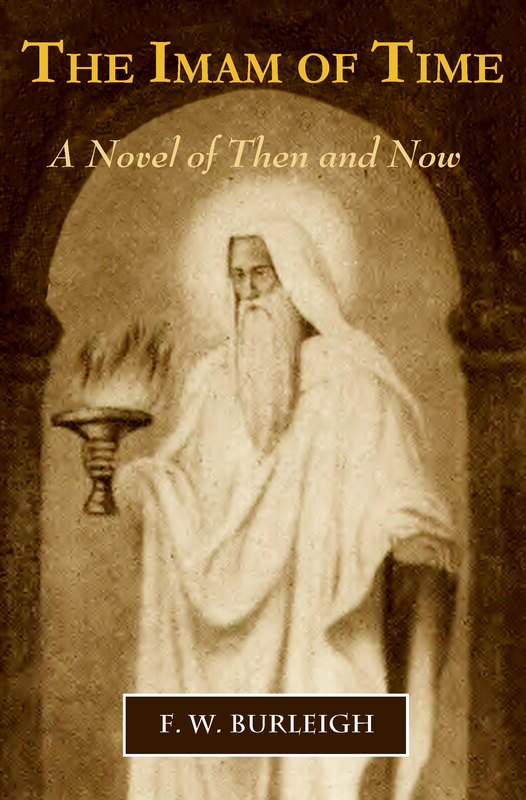 THE IMAM OF TIME is not a clumsy sci-fi time travel novel, but a deft work of magical realism, a crucial element that uses the cave and well motifs of Islam for going into the past and returning to the present: The hero enters a cave of light, and the light speaks to him just before he finds himself nearly drowning in a well somewhere in 7th century Arabia; he returns to contemporary Iran through the Well of the Mahdi where the Shias await the appearance of their Savior, their Imam of Time. The hero must go into the past in order to realize the truth of the origin of the violence of Islam. The reader follows him along the path of his experience. When he finally flees Muhammad’s world, he ends up spending three months in a monastery where he acquires and abiding love for Jesus. The hero then embarks on the caravan trail and ends up in India where he has a startling revelation about the universal drive behind all religion. When he returns to Iran through the Well of the Mahdi, his revelation forms the basis for his message of religious tolerance to his contemporaries, a message that ultimately costs him his life. But in dying he creates something new. The book has a touching love angle involving Rayhaneh. In the Islamic histories, she became an unwilling concubine of Muhammad after he slaughtered the men of her Jewish tribe, and she died four years later of grief. In The Imam of Time, she is from present day Iran just like the hero and finds herself somehow sent into the past where she becomes Muhammad’s captive and concubine. But she doesn’t die after four years, she vanishes and returns to the present where she becomes involved with the hero through their shared experience, and ultimately they marry. It wasn’t intended, but it turns out there’s a notable contrast between the way Muhammad treated her and the way the hero treats her. (VOICE OF EUROPE) — Recently, Swedish journalist Katerina Janouch interviewed the Swedish policeman Peter Springare, who in 2017 made headlines in Sweden, when he posted on the current state of the kingdom on Facebook. – I am deeply concerned about the development. And I’m wondering how far it must go before people in decision-making positions and politicians wake up and see where we are heading. One continues to put the head in the sand. In Helsingborg, but also here in Örebro, one goes out and say we have full control. It’s the other way around, we’ve lost control. And in the next breath one says that this just spurts us, that we do not give in. That we’ll will work even harder. But that’s not the case either. Because I know how one is affected when exposed to threats. It certainly affects. It affects the police operations, both the business and individual police officers. And then the debate will be, is it worth it, should we expose ourselves … I know there are a number of police officers in Örebro who do not want to go to work for example in Vivalla. Because it is unpleasant. When we reach that point, we are in really, really bad shape. When the police end up in a situation where one is afraid to end up in an ambush, then it has gone very, very far and we are in trouble. To me, it’s a mystery how police chiefs to the public persists that we have full control. What do they want to gain?